What’s the relationship between the goldfinch and Christian art? What birds are commonly portrayed as pets in paintings by famous artists? And how do artistic renderings of our winged neighbors differ by time period and place? This week’s post will look at these questions and a few other related topics. There are, of course, many aspects to consider when examining birds in art, most of which will have to be included at a later time. After all, this is a large subject, and birds have fascinated artists for a long time. Depictions of our winged neighbors exist in prehistoric cave paintings, inside burial chambers and ancient temples, within illustrated manuscripts such as bestiaries, and most frequently as awe-inspiring pieces for wealthy patrons and museums. By looking at a small sample of masterpieces from just the past thousand years, we can easily see how birds bless us with their beauty, provide us with a sense of communion with nature, and evoke feelings that extend well beyond their physical form. The old adage goes, “A picture is worth a thousand words.” Obviously, paintings communicate a great deal of information to the viewer. And symbolism is one of the most powerful means at an artist’s disposal, quite evident in the depictions of certain birds. Take for example the popularity of the European goldfinch. Ornithologist Herbert Friedmann, in his book The Symbolic Goldfinch, notes that the bird’s image occurs in more than 480 paintings of the late medieval period and Renaissance (1, 2, 3). 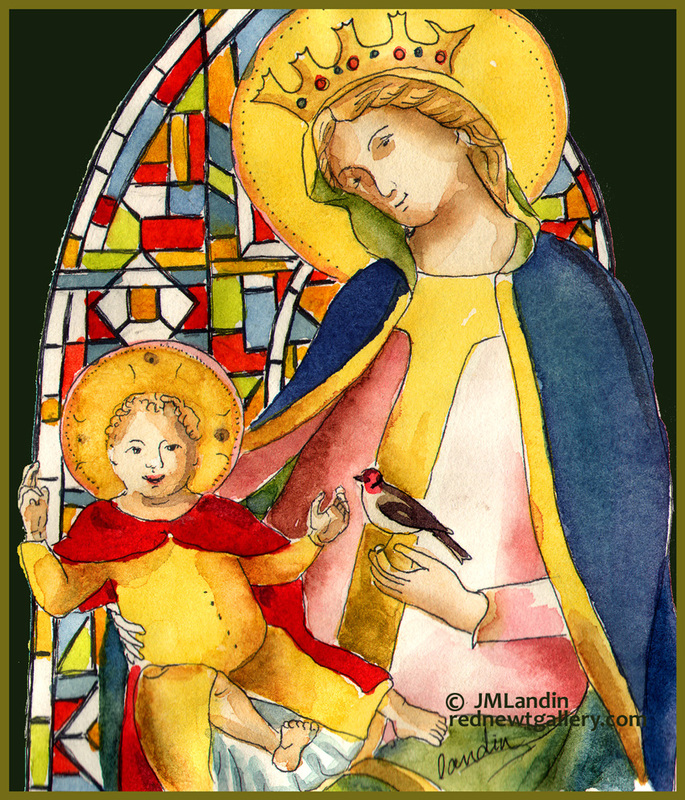 As famously rendered in paintings attributed to Raphael (Madonna del cardellino), Leonardo da Vinci (Madonna Litta), and many others, the bird is a frequent fixture in compositions featuring the young Christ child with his mother Mary. But why? What does a goldfinch, a bird with no direct Biblical references, have to do with Christianity? Could the reason lie with special meaning that particular bird had at that time to those artists, their patrons, and their viewers? In fact, religious belief and social circumstances were quite critical aspects of European life around 1500. And both, as Mark Cocker explains in Birds & People, affected how the goldfinch came to be seen, in essence, as an allegorical representation of Jesus. For starters, folklore already linked the red markings on the bird’s head to the crown of thorns placed upon Christ during the Passion. But, like Jesus, the bird was thought, too, to be a physician of sorts. Cocker notes that this is because the goldfinch was one of the avian candidates for the mythical charadrius, sometimes referred to as charadrios (4) or caladrius (5, 6). According to ancient sources, such a bird reportedly possessed the ability to heal the sick by staring back into their eyes. Various candidates have been named for these mysterious creatures, including bitterns, curlews, gulls, and plovers. Although the bird is described as having white feathers, in several instances it is said to be yellow or golden (7). The latter, of course, would lead to associations with the goldfinch, as would other forces. The Black Death was a prevalent and destructive force in fourteenth- and fifteenth-century Europe. Since nothing seemed to halt the disease, belief in the charadrius took on a new and desperate role, existing in the form of a religious image. “A dominant feature of the age,” Cocker reminds us, “was the recurrent nightmare of plague, and by incorporating European Goldfinches into paintings the artists were invoking the curative powers of the charadrios on behalf of their contemporary audience.” Thus, the bird, quite popular throughout Europe, became a kind of “visual good-luck charm” (8). Due in part to its popularity as a pet, the goldfinch was also portrayed in several famous paintings without any overt religious connections. Francisco De Goya’s eighteenth-century painting Don Manuel Osorio Manrique de Zuniga (9), for instance, depicts the birds within a cage, while a tethered magpie and several cats are positioned curiously nearby. Approximately a century earlier, Abraham Mignon’s Fruit Still-Life with Squirrel and Goldfinch (10) illustrates the goldfinch pulling a small container of sustenance up towards itself, something these birds can actually be trained to do (11). And then there’s Carel Fabritius’ 1654 painting The Goldfinch, which like Mignon’s piece, portrays the bird chained by one of its legs. The Fabritius work (12), of course, may be the most recognizable artistic rendering of this bird today, thanks in part to how it features prominently in Donna Tartt’s novel The Goldfinch, winner of the 2014 Pulitzer Prize for Fiction. Though the goldfinch clearly has a special place in European art, it is but one of many birds to attract considerable attention from painters. Parrots are another favorite, included in Western works ranging from Peter Paul Rubens’ The Holy Family with Parrot to several of Frida Kahlo’s still-life paintings and self-portraits with her pet birds, such as Yo y Mis Pericos (“Me and My Parrots”) (13). These exotic birds are associated with a wide variety of characteristics, but typically represent beauty and sensuality. Of course, members within the parrot or psittacidae family appear as well in art from many parts of the world, such as Chinese emperor Zhao Ji’s twelfth-century handscroll Five-Colored Parakeet (14) and the vibrant sixteenth-century manuscript illustrations accompanying Central Asia’s Tuti-Nama (“Tales of the Parrot”) (15). In the Far East, illustrations of birds frequently appear on hanging scrolls, handscrolls, screen panels, and fans. Besides parrots, widespread avian subjects consisted of cranes, peacocks, swallows, and crows. Quian Xuan’s thirteenth-century Return of Swallows, Bian Jinzhao’s fifteenth-century Three Friends and a Hundred Birds, and Gao Qifeng’s twentieth-century Peacock Spreading Tail (16) are several Chinese examples. Japanese artist Katsushika Hokusai, internationally renowned today for his woodblock print series Thirty-Six Views of Mt. Fuji, also included birds in his works, such as Cranes on a Snowy Pine, Willow and Birds, and Hydrangea and Swallow (17). Several of Hokusai’s contemporaries, such as Maruyama Okyo and Shibata Zeshin, produced memorable paintings featuring crows, birds that are also part of Western masterpieces like Pieter Bruegel the Elder’s Hunters in the Snow, Pablo Picasso’s Woman and a Crow, and what is likely Vincent van Gogh’s last work, Wheatfield with Crows—though, Cocker offers details that suggest that the latter’s subject matter may instead be rooks (18). Over the past two hundred years, artistic depictions of birds have become much more varied in style. Some works, such as Salvador Dali’s 1949 painting Leda Atomica, reinterpret a popular, recurring theme in literature and art, in this case the “Leda and the Swan” myth. Dali’s swan is rendered in near-realistic detail, an aspect quite unusual for much of twentieth-century Western fine art. More, however, can often be stated with less. This, for instance, is the case with Henri Matisse’s 1947 Les Oiseaux (“The Birds”). The painting’s beauty clearly lies in its simplicity, as white, dove-like shapes flutter on a field of blue sky. The same holds true with Paul Klee’s 1922 Twittering Machine (19), but with different results. Whereas Matisse, I think, evokes a warm sense of child-like innocence with his painting, Klee’s simple lines illustrating mechanical birds perched on a crankshaft create a rather unsettling effect, his work a possible symbolic statement on humankind’s naïve subjugation of nature. A multitude of other styles are available for fans of bird art. The late Charley Harper’s “minimal realism”, for example, renders subjects into colorful, geometric shapes. Some of his most famous pieces feature the northern cardinal, such as the 1969 painting A Good World, and the 1988 work A Day in Eden (20). And then there’s Picasso’s 1911 Cubist masterpiece Le pigeon aux petits pois (“The Pigeon with the Peas”) (21), which employs numerous dynamic sweeps and angles—providing complex but non-naturalistic perspectives of its avian subject. The work is a drastic departure of the more lifelike depictions of birds in the paintings of Picasso’s father and instructor Don José Ruiz y Blasco. Many artists, especially those who also doubled as naturalists, wanted to portray avian species as realistically as possible in the subjects’ natural habitat. John James Audubon’s nineteenth-century The Birds of America remains the most celebrated of such works. Of course, naturalistic painting is alive and well today. But it’s just one among many styles in which we humans seek to connect with our winged neighbors. Friedmann, H. The Symbolic Goldfinch. New York: Pantheon, 1946. pp. 4-5. Cocker, M., Tipling, D. Birds & People. London: Jonathan Cape, Random House, 2013. pp. 500-501. “The Goldfinch in Renaissance art.” Presented as part of the BirdLife State of the world’s birds website, 2008. BirdLife International: http://www.birdlife.org/datazone/sowb/casestudy/95. Cocker, M., Tipling, D. pp. 501-502. Druce, G.C. “The Caladrius and Its Legend, Sculptured upon the Twelfth-Century Doorway of Alne Church, Yorkshire.” Archaeology Journal, 1913. Vol. 69: pp. 380-416. Heck, C., Cordonnier, R. The Grand Medieval Bestiary: Animals in Illuminated Manuscripts. New York: Abbeville Press Publishers, 2012. p. 188. Cocker, M., Tipling, D. p. 502. “Manuel Osorio Manrique de Zuñiga (1784–1792),” The Metropolitan Museum of Art, New York: http://www.metmuseum.org/toah/works-of-art/49.7.41. “Abraham Mignon – Fruit Still-Life with Squirrel and Goldfinch,” Wikimedia Commons: http://commons.wikimedia.org/wiki/File:Abraham_Mignon_-_Fruit_Still-Life_with_Squirrel_and_Goldfinch_-_WGA15666.jpg. Birkhead, T. The Wisdom of Birds: An Illustrated History of Ornithology. New York: Bloomsbury USA, 2008. p. 105. “The Goldfinch”, The Frick Collection: http://www.frick.org/exhibitions/mauritshuis/605. “Yo Y Mis Pericos,” The Frida Kahlo Foundation: http://www.frida-kahlo-foundation.org/Yo-Y-Mis-Pericos.html. “Bird Painting”, China Online Museum: http://www.chinaonlinemuseum.com/painting-birds.php. “Parrot addressing Khojasta in Tutinama commisioned by Akbar,” Wikimedia Commons: http://commons.wikimedia.org/wiki/File:Parrot_addressing_Khojasta_in_Tutinama_commisioned_by_Akbar,_c1556-1565.jpg. “Bird Painting,” China Online Museum. Katsushika Hokusai: The Complete Works: http://www.katsushikahokusai.org. Cocker, M., Tipling, D. pp. 388-390. “Twittering Machine” (Die Zwitscher-Maschine), The Museum of Modern Art, New York: http://www.moma.org/collection/object.php?object_id=37347. Harper Originals, Estate of Charley Harper: http://www.harperoriginals.com/charleys-originals/. “£430m of paintings stolen in Paris,” The Independent: http://www.independent.co.uk/arts-entertainment/art/news/pound430m-of-paintings-stolen-in-paris-1978312.html?action=gallery&ino=2. Thousands of revelers inundate the streets of New Orleans, Rio de Janeiro, and Venice at this time of year, many decked out in festive regalia and costumes. Among the strangest of the decorative masks found at such Mardi Gras and Carnival celebrations is the so-called Medico della Peste. 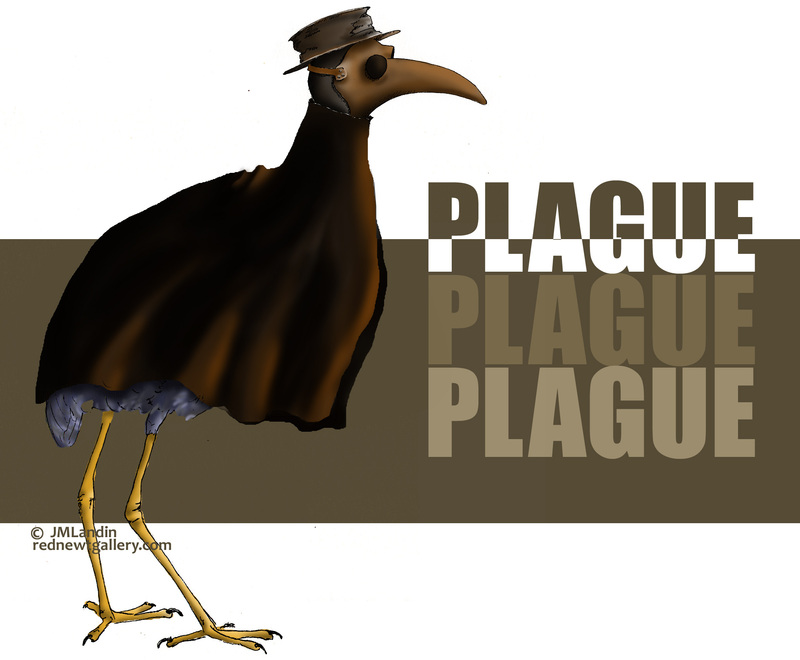 Easily recognized for its beak-like protrusion, this disguise is connected to the worst pandemic in human history. Donning masks is a centuries-old tradition. Throughout the West, disguises have been generally adopted for special holiday observances and masquerades. The anonymity that costumes provide, too, are helpful to wearers when seeking to breach the restraints of social protocol or engage in nefarious activities. But the creation of the above mentioned strap-on bird mask came about due to another matter. Neither deceit nor secrecy appear to have been crucial to its initial function. Designed by seventeenth-century physician Charles de Lorme, the Medico della Peste (literally “Plague Doctor”)—as the name implies—was clearly not intended for festive occasions (1, 2). Instead, it was one of several components worn for protection by doctors while attempting to treat patients afflicted with the bubonic plague. Other items of the physician’s elaborately layered outfit included a hat, hood, gown, pants, gloves, and boots, together operating as multiple barriers of protective gear. Several pieces of apparel were even made from leather and coated with wax to repel bodily fluids and thwart contamination (3, 4). The mask’s unique features were of particular significance. Centuries ago, people did not understand how the bubonic plague was transmitted. Numerous ideas made their rounds, one being that birds were somehow responsible. Notice was perhaps made of carrion-seeking fowl eating the flesh of animals who had clearly died from the disease. The notion was even considered that the bird-like appearance of the mask could help pull or “draw” the disease away from the patient (5). This idea may have stemmed from ideas long circulated about the charadrius, a mythical bird depicted in the Physiologus. That ancient text credited this creature, affiliated over the centuries with several avian species, as having the ability to heal the sick by gazing into the afflicted person’s eyes (6). The more popular view, though, regarded malodorous air as the disease’s culprit, a belief known as “miasma theory” that goes back as far at least to ancient Greek medicine (7). Hence, strong-scented spices and herbs, such as dried rosemary, juniper, lavender, cinnamon, cloves, and the like were prescribed for cleansing the air (8, 9). And items such as these were also placed within the beak area of the mask, near the air holes, for the same purpose (10, 11, 12). In addition, the mask included red- or clear-colored spectacles believed to protect the wearer’s eyes from the unpleasant smell and possible contamination of diseased air (13, 14, 15). Today, of course, we know that the plague is caused by the Yersinia pestis bacterium, which can be transmitted to humans by fleas. After feeding on small infected mammals, such as rodents, the insects passed along the bacterium centuries ago to their subsequent human hosts. Birds cannot contract the disease. However, raptors, such as hawks and owls, could have transported infected fleas with them when catching mice, rats, and the like (16). Overall, our feathered friends were neither directly responsible for the pandemic nor potentially able to act as healing agents. Any powers attributed to them, either positive or negative, turned out to be as ineffective as the plague doctors. “The mask of the plague doctor: a practical object turned into a symbol,” 12/11/13. Ca’Macana: http://www.camacana.com/the-plague-doctor/#.VFVEcsms7Qw. “The mask of the plague doctor: a practical object turned into a symbol,” 12/11/13. Ca’Macana. Abbott, R.C., Rocke, T.E. Plague. Reston, VA, U.S. Geological Survey Circular 1372, 2012: http://pubs.usgs.gov/circ/1372/pdf/C1372_Plague.pdf. Curley, M.J. (Translator). Physiologus: A Medieval Book of Nature Lore. Chicago: University of Chicago Press, 1979. pp. 7-8. Osheim, D.J. “Plague and Public Health in Europe, with Special Reference to Sixteenth-Century England: An Introduction to Orders thought meete by her Maiestie …, 1578,” The Plague Book. Historical Collections at the Claude Moore Health Sciences Library, University of Virginia: http://historical.hsl.virginia.edu/plague/osheim.cfm. McKeithen, A. “Advices for Preventing and Curing Plague in Sixteenth- & Seventeen-Century England,” The Plague Book. Historical Collections at the Claude Moore Health Sciences Library, University of Virginia: http://historical.hsl.virginia.edu/plague/mckeithen2.cfm. Earth, air, and water. Birds embody transition, shifting effortlessly from one realm to another. What if these graceful beings, however, also possessed the power to freely pass to and from other worlds, going off to some Great Beyond or communing with the divine? Ancient art and scriptures throughout much of the world, from India to Egypt, allude to these kinds of beliefs. The earliest depictions of avian creatures, discovered in caverns of Western Europe, such as Lascaux, Les Trois Frères, Cosquer, Chauvet, and El Pendo (1, 2), provide our first look into how humankind viewed its relationship with birds. Some of the art, which includes designs of owls and auks, dates back to at least 15,000 years ago (3, 4). Ornithologist Edward Armstrong notes that such prehistoric images of birds, usually found in remote cave areas, are actually not common, adding, “The secretive location of these designs suggests they had some esoteric or magical significance” (5). As civilization developed centuries later, the ideas behind bird imagery became bolder and more well-defined. Birds in the iconography and stories of antiquity often hold varying degrees of religious significance. In some instances, the creatures were directly linked with divine entities. For example, in ancient Greece, carvings and sculptures of birds associated with certain deities (e.g., Zeus’s eagle) appeared on temples (6). In parts of India, a wide range of art and architecture features birds, including Buddhist stupas from fourth-century BCE and Hindu stepwell relief sculptures as early as seventh-century CE (7). Hinduism, like other ancient belief systems, connects several of its divine entities with winged associates. Brahma and his consort Saraswati, for instance, have the peacock (8). Other examples of such pairings include the partridge, linked with the god Indra, and the parrot, a favorite of Kama, the god of love (9, 10). Not just associated with the divine, birds also exemplify the spiritual or transcendent aspects of human life and also life-after-death. For instance, bird symbolism is used in the Hindu Rigveda to describe the passage of the human spirit once liberated from the body (11). Other kinds of stories, though, seem less figurative, in that they tell of people who supposedly changed form. The eighth-century Kojiki, a collection of ancient Japanese myths and historical accounts, reports of an early hero who upon death transforms into an enormous seabird. The description is rather moving: “His wife and children chase after [him] over sea and shore,” scholar Yoel Hoffmann explains, “cutting their feet on bamboo stumps and singing songs of mourning” (12). In many cultures, birds appear as psychopomps or guides to the afterlife. Some examples include the so-called “Three Birds of Rhiannon”, believed by the ancient Welsh to sing on battlefields (13), and the Celtic goddess Mórrigan said to appear to dying warriors as a crow (14). I can imagine that in such scenarios the weary, untethered spirit was assumed to flutter out of a battle-torn corpse, emerging in flight with its avian guides. Such escorts to the netherworld or afterlife, of course, are not always connected to combat-related fatalities (see a previous post here for some additional information). As naturalist Ernest Ingersoll notes in his early twentieth-century classic Birds in Legend, Fable, and Folklore, ideas “… that the disengaged soul departs to heaven in the form of or by aid of a bird is historically very old” (15). Disparate cultures are known for such beliefs, including the Assyrians, Aztecs, and Australian aborigines (16). The ancient Egyptians, in particular, were among the earliest of civilizations enthralled by myriad aspects of the spiritual with birds. Besides worshipping a list of deities represented with avian heads (e.g., Geb, Horus, Thoth, Nut, etc. ), Nile River Valley residents millennia ago also emphasized the roles of birds throughout an elaborate system of burial practices and afterlife beliefs. Archeologists have discovered avian imagery and relics in the Egyptian tombs of ancient rulers, scribes, and other officials of high rank. In several instances, bird iconography found at these sites appears to celebrate the hunting prowess of the deceased, such as the wildfowl hunt scene paintings in King Tutankhamen’s tomb (17), Nebamum’s burial chamber (18), and the tomb of Khnumhotep II (19). Experts believe that paintings like these may have also held some sort of magical significance, working as enchantments “to control chaos and to destroy evil forces” (20). In this sense, the Egyptians may have created the images as some arcane means of offering protection and subsistence for the spirit and preserved body in the hereafter. Besides paintings, other bird-related items to aid the deceased have been found in cemeteries and tombs. For instance, Book of the Dead papyri provide “transformation spells” that include incantations for becoming a “falcon of gold”, “heron”, “swallow”, and “phoenix”, among other possible creatures in the afterlife (21). Furthermore, small figurines of human-headed birds were usually left near the mummified remains. Referred to as ba-birds, the items were thought to represent the deceased’s spirit or ba, giving it the ability to move on as needed in its afterlife (22). Even preserved bodies of birds and other animals were enclosed in tombs and sanctuaries. Archeologists have discovered millions of mummified ibises within Thothian temples at Saqqara and Tuna al-Gebel (23). Similar counts exist at necropolis sites of other animals, ranging from birds such as falcons to lizards, beetles, and jackals (24). The Egyptians apparently were obsessed with all forms of the eternal. Birds, though, important in many early cultures, clearly played a pivotal part in their complex belief system. Armstrong, E.A. The Life & Lore of the Bird: In Nature, Art, Myth, and Literature. New York: Crown Publishers, Inc., 1975. p. 200. Cocker, M., Tipling, D. Birds & People. London: Jonathan Cape, Random House, 2013. pp. 227, 272, 280. Armstrong, E.A. The Life & Lore of the Bird. p. 200. Cocker, M., Tipling, D. pp. 227, 272, 280. Cocker, M., Tipling, D. p. 155. Bhatt, P.M. “Birds and Nature in the Stepwells of Gujarat, Western India.” Tidemann, S., Gosler, A. (editors). Ethno-ornithology: Birds, Indigenous Peoples, Culture and Society. Washington, D.C.: Earthscan, 2011. pp. 141-151. Bunce, F.W. A Dictionary of Buddhist and Hindu Iconography. New Delhi: D.K. Printworld, 1997. pp. 140, 278. Werness, H.B. The Continuum Encyclopedia of Animal Symbolism in Art. New York: The Continuum International Publishing Group Inc., 2004. pp. 317, 319. Hoffmann, Y. Japanese Death Poems: Written by Zen Monks and Haiku Poets on the Verge of Death. Rutland, Vermont: Tuttle Publishing, 1986. pp. 33-34. Ingersoll, E. Birds in Legend, Fable and Folklore. New York: Longman, Green and Co., 1923. p. 14. Wilkinson, P., Philip, N. Mythology. New York: Dorling Kindersley Limited, 2007. p. 105. Ingersoll, E. Birds in Legend, Fable and Folklore. p. 149. Armstrong, E.A. The New Naturalist: A Survey of British Natural History – The Folklore of Birds: An Enquiry into the Origin & Distribution of Some Magico-Religious Traditions. London: Willmer Brothers & Haram Ltd., Birkenhead for Collins Clear-Type Press. p. 49. Armstrong, E.A. The Life & Lore of the Bird. p. 204. Cocker, M., Tipling, D. p. 376. Bailleul-LeSuer, R. (editor). Catalog no. 34, “Birds in Death and the Afterlife.” Between Heaven and Earth: Birds in Ancient Egypt (publication for Oct. 15, 2012 – July 28, 2013 exhibition). The Oriental Institute of the University of Chicago: Oriental Institute Museum Publications 35, 2012. p. 201. Scalf, R. “The Role of Birds within the Religious Landscape of Ancient Egypt.” Bailleul-LeSuer, R. (editor). Between Heaven and Earth: Birds in Ancient Egypt (publication for Oct. 15, 2012 – July 28, 2013 exhibition). The Oriental Institute of the University of Chicago: Oriental Institute Museum Publications 35, 2012. pp. 34-35. Wilkinson, P., Philip, N. p. 299.